This agreement is suitable for a collective medical clinic practice comprised of individual physicians leasing space in a medical office building on a hospital campus. 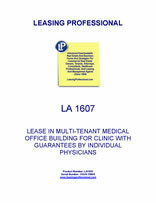 The individual doctors personally guarantee the performance of the tenant under the lease. The medical office building has yet to be built, and the tenant has a termination right if its construction does not commence by a specified date. This Lease (“Lease”) is made as of _________________, by and between COMMERCIAL MEDICAL PROPERTY LANDLORD, INC., a __________________ corporation (“Landlord”), and AGREEABLE MEDICAL ASSOCIATES, INC., a _________________ corporation (“Tenant”). Rentable Area of the premises: ______________________. Rental Commencement Date: ______________________ . Use: Medical Office and Clinic and activities incidental thereto. 1. DEFINITIONS. Each of the following defined terms, shall have the meaning ascribed thereto by this paragraph 1. A. "Building" means that certain medical office building known as ____________________________, and located at ____________________. B. "Medical Office Building I" shall mean the Building together with the following, as they may from time to time exist, common areas, a connecting walkway to the Charitable Hospital, and a parking lot, together with all alterations, additions and replacements thereto, and related amenities. C. "Premises" shall mean that portion of the Building shown on the plan attached hereto as Exhibit "A", as adjusted by the final "Plans", as that term is defined in the Tenant Improvement Agreement attached hereto as Exhibit "C" (the "Tenant Improvement Agreement"). D. "Rentable Area" of the Premises means the total of (1) the gross area thereof (the "Premises Gross Area") as measured on the final Plans from and to the inside glass surface of the exterior building walls, and from and to the center of any partition walls which separate the Premises from adjoining tenant and common areas; plus (2) the pro rata part of the common areas of the Building (including all building corridors, entry areas, building bathrooms, postal areas and all other facilities commonly available to all tenants). For purposes of calculating such pro rata share, it is hereby agreed that the total of the gross area for all Tenants of the Building constitutes ___% of the total area of the Building, and that the total of all common areas of the Building constitutes ___% of the total area of the Building. It is hereby further agreed that the Rentable Area of the Premises is subject to adjustment based on the final determination of the Premises Gross Area under the Plans. 2. PREMISES AND TERM. In consideration of the obligation of Tenant to pay Base Rental and Additional Rental as herein provided, and in consideration of the other terms, provisions and covenants hereof, Landlord hereby demises and leases to Tenant, and Tenant hereby accepts and leases from Landlord the Premises, with no easement for light or air included in the Premises, to have and to hold the same for the term described below (the "Lease Term"). The Lease Term shall commence on the date specified in the Lease Summary as the Commencement Date (the "Commencement Date"), which is the date on which Landlord anticipates that the Premises will be substantially completed in accordance with the Tenant Improvement Agreement (but which date is subject to adjustment pursuant to the Tenant Improvement Agreement), and shall end at 6 p.m. on the date specified in the Lease Summary as the Expiration Date (the "Expiration Date"). Except as provided in the Tenant Improvement Agreement, the rental due hereunder from Tenant shall commence on the Commencement Date. If, for any reason whatsoever, the Premises are not substantially completed by the Commencement Date, or if Landlord, for any reason whatsoever, cannot deliver possession of the Premises to Tenant on the Commencement Date, this Lease shall not be void or voidable, nor shall Landlord be liable to Tenant for any resulting loss or damages. No delay in delivery of possession shall operate to relieve Tenant of Tenant's obligations to Landlord, except where such delay results in an adjustment of the Commencement Date and the Rental Commencement Date pursuant to the Tenant Improvement Agreement. Landlord shall be deemed to have delivered possession of the Premises for Tenant's occupancy on the date on which Landlord has notified Tenant that the "Work", as that term is defined in the Tenant Improvement Agreement, is substantially complete, subject only to completion of items customarily classified as "punchlist items" in the construction industry (such date hereinafter referred to as the "Occupancy Date"). Within ten (10) days after the Occupancy Date, Tenant shall execute and deliver to Landlord a Tenant Acceptance Agreement in the form attached hereto as Exhibit "B" Tenant may state in such Tenant Acceptance Agreement any defects in the Premises remaining to be repaired or completed by Landlord ("Punchlist Items"), provided, however, that acceptance by Landlord of the Tenant Acceptance Agreement with a statement of Punchlist Items shall not constitute the agreement of Landlord to repair or complete any Punchlist Items not included in the "Working Drawings," as that term is defined in the Tenant Improvement Agreement. Tenant shall have waived objection to any defects not enumerated in a Tenant Acceptance Agreement, except for latent defects not discoverable by reasonable diligence of Tenant, and to any defects of any nature if a Tenant Acceptance Agreement is not executed and delivered within said ten (10) day period. A. Tenant covenants and agrees to pay to Landlord during the Lease Term the amounts specified in the Lease Summary (the "Base Rental") as rent for the Premises. The Base Rental shall be paid in equal monthly installments in advance, without demand, deduction or set off, on the first (1st) day of each and every calendar month during the Lease Term. A prorated monthly installment shall be paid in advance on the Commencement Date for any fraction of a month if the Lease Term begins on any day other than the first day of any month and on the first day of the final month of the Lease Term for any fraction of a month if the Lease Term shall terminate on any day other than the last day of any month. B. Commencing ________, and on every January 1 thereafter, the Base Rental shall be increased to an amount equal to the product of: (i) the amount of Base Rental set forth in Paragraph 3A of this Lease (as increased from time to time by earlier adjustments established by this Paragraph 3B) multiplied by (ii) 1.02. C. Tenant covenants and agrees to pay to Landlord during the Lease Term such sums as are referred to herein as "Additional Rental" when due, without demand, deduction or set off. (i) During each December of the Lease Term, or as soon thereafter as practicable, Landlord shall give Tenant written notice of its estimate of Additional Rental payable under this paragraph for the ensuing calendar year. On or before the first day of each month during the ensuing calendar year, Tenant shall pay to Landlord one-twelfth (1/12) of such estimated amounts together with the Base Rental, provided that if such notice is not given in December, Tenant shall continue to pay such Additional Rental during the ensuing calendar year on the basis of the amounts payable during the calendar year just ended, until the month after such notice is given. (ii) As soon as practicable after the close of each calendar year during the Lease Term, Landlord shall deliver to Tenant a statement of the adjustments to be made for the calendar year just ended. Such statement shall be final and binding upon Landlord and Tenant absent manifest error. If on the basis of such statement Tenant owes an amount that is less than the estimated payments for the calendar year just ended previously made by Tenant, Landlord shall credit such excess to the next payments of Additional rental coming due. Tenant shall pay as Additional Rental the deficiency to Landlord within thirty (30) days after delivery of the statement. (iii) If this Lease shall terminate on a day other than the last day of a calendar year, the amount of Additional Rental payable shall be prorated. The termination of this Lease shall not affect the obligations of Landlord and Tenant to be performed after such termination, pursuant to this paragraph 4. "Operating Expenses" as used herein shall mean all actual costs and expenses of operation, maintenance, repair, ad valorem taxes, management, and security of the Building. Operating Expenses shall not include (i) depreciation on the Building and personal property, (ii) Tenant Improvement Costs, (iii) payments by Landlord of interest and principal on any mortgage secured by the Building, (iv) the cost of special services rendered to a particular tenant of the Building, which are paid or reimbursed by such tenant, and (v) leasing commissions.